Prank calls to the police are no novelty. But what if a delivery order made to 112 is really a distress call in disguise? 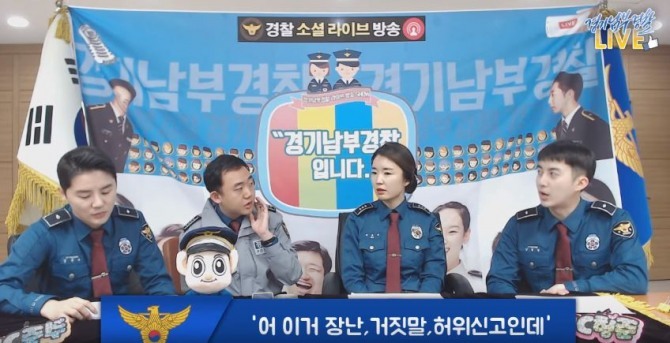 The Gyeonggi Nambu Police is making use of its celebrity conscripted officers XIA Junsu and Kim Hyung-jun in airing these informative awareness broadcasts every other Thursday. In the latest broadcast, the police shared recorded clips of actual emergency calls it had received that are worth taking a second listen to, via Facebook Live broadcast. Of the two clips shared, the first starts with a woman asking for jjajangmyeon delivery to a motel room. Jjajangmyeon is a typical delivery food in Korea that is noodles dressed in savory black sauce. “Yes,” says the woman, without giving herself away to the perpetrator who is probably with her in the motel room. After getting the address, the police tells the woman to tell the boyfriend the jjajangmyeon will come in no time. The second recorded clip is of a woman who is held by a man inside a motel room. She addresses the police officer as her daughter. “Dear, now you’ve heard my voice, I would like you to come to where I am,” says the woman. It was lucky for her the officer was a female in this case, as the man who is with her in the motel room intercepts the phone to verify if the woman is really talking to the daughter. The police officer coolly asks the man return the phone to her ‘mother,’ gets the address and dispatches officers to the room.